Increasing the income of the communities is a common aspect of several of the Humana development cooperation projects. An example in this regard is the project based on improving access to sustainable and accessible energy services for rural and peri-urban populations, in this case in the Oio Region, in Guinea-Bissau, specifically in Bissora. The action is part of the Energy Facility of the European Union. One of the aspects that included in principle was the generation of biofuel from the oil obtained from seeds of jatropha. The excessive acidity of this oil made it difficult to produce bio fuel. However, oil proved to be perfect as a base component for soap making. 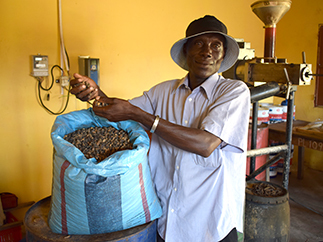 Therefore, jatropha processing centers, such as the one located in the Tabanca (a little town) of Watiné, decided to produce soap for selling in local markets. The benefits obtained are devoted to the purchase of raw materials to guarantee the production. To achieve the sustainability of the initiative, a previous awareness-raising work was carried out with the population nearby to observe as an opportunity the collection of jatropha seed for soap production, since the processing center pays 150 CFA francs per kilo of seeds. Jatropha is usually planted around the cultivation fields, as a fencing, to protect the crops of animals. Nowadays, there are two types of soap: for personal hygiene and for washing. 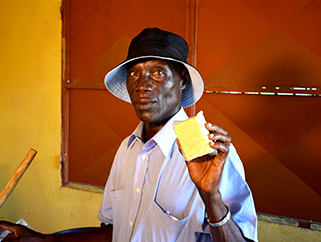 Ianaba Bofá, responsible for the manufacture of soap in Watiné, explains how to prepare them. "The first one is prepared with 1 liter of water, 200 grams of soda and 100 milliliters of jatropha oil. Additionally, crushed leaves of medicinal plants and fruits such as papaya are added, to give them an aroma. " The laundry soap is prepared, says Bofá, "from 2 liters of water, 800 grams of soda and 100 milliliters of oil. In both cases, once ready, it is cut into pills for sale to the public. " Last year, the Foundation donated € 158,196 to cooperation projects in Guinea-Bissau, from the funds generated with the valuation of used clothing.